Do you remember the scene from Legally Blonde, where Elle is stuffing her face with chocolates after her breakup? For many people, that scene hits close to home. There are many ways people deal with depression, disappointment, anxiety and loneliness. Some people turn to drinking, others turn to working out and others overeat. How Big of a Problem is Overeating? The American Psychological Association reports that emotional eating is a common and under recognized problem. According to one of their studies, nearly two out of five adults report overeating over the past month to cope with stress. For some people, overeating is a way of coping with an occasional stressor in their lives, such as a layoff or a breakup. However, the American Psychological Association reports that a third of respondents that engaged in overeating admitted it was a chronic problem, which forces them to turn to Epixweightloss Solutions to shed the excess pounds. Most people recognize emotional eating is a problem. Nearly half of respondents said they felt guilty after overeating and felt bad about their bodies afterwards. However, overeating is still a common problem that people have difficulty overcoming. Many people have significantly reduced their weight by stopping themselves from overeating. Here are some case studies for inspiration. Laurie Swanson, a 36-year old woman that weighed 321 pounds. Laurie told the Huffington Post that she was a chronic over eater since she was a child. She overate primarily to cope with emotional issues, but was active enough that she didn’t start to gain weight until her 30s. She finally realized enough was enough. She conquered her overeating problems and lost 77 pounds. Diana Wehbe is another success story of a woman that overcame emotional eating. She shared her story with Women’s Health Magazine about how she lost nearly 100 pounds by finding other ways to deal with the stress in her life. Wehbe said that one of the reasons she overate was to cope with the criticisms of her ex-boyfriend. She had poor self-esteem already and would feel compelled to eat more when he put her down. Emotional eating is clearly a common problem. Unfortunately, even though people recognize it is an issue, they have difficulty overcoming it. Fortunately, a few new studies have shed some light on it. 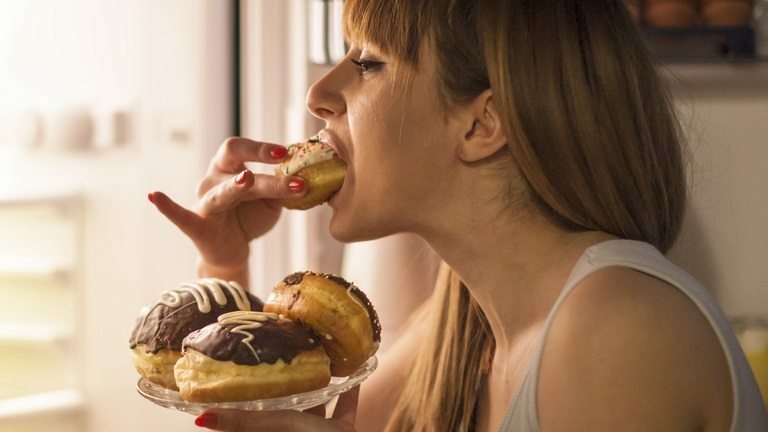 Here are some tips to help you keep emotional eating from ruining your life. Andrew Calvin, a cardiovascular disease and assistant professor of medicine at Mayo Clinic in Rochester, conducted a study that showed a strong link between sleep deprivation and emotional eating. The findings aren’t surprising, because people tend to be more likely to suffer from depression if they haven’t received enough sleep. We live in a society that discourages people from expressing their emotions. This is particularly common with men. Unfortunately, suppressing emotions is a terrible way to deal with them and tends to contribute to harmful coping strategies such as emotional eating. A 2012 study from Department of Psychology, Babeş-Bolyai University in Romania found that people that forced themselves to find a more positive outlook on their emotions were less likely to resort to emotional eating. Research has also shown that people who are overworked tend to be more likely to turn to emotional eating. If you find yourself working long days, you may need to try cutting back or finding a better way to cope with the stress.